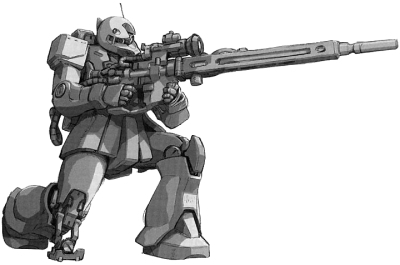 The MS-05L Zaku I Sniper Type is a MS-05B Zaku I reequipped for sniping purposes. Over the normal type, this mobile suit has an improved mono-eye sensor and redesigned head for better visibility and durability. 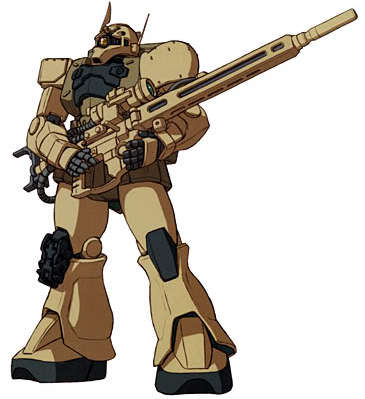 The MS-05L Zaku I Sniper Type is installed with the same type of camera lenses as the MS-06E Zaku Reconnaissance Type but revised for higher magnification zoom. The improved sensors come with night and thermal vision to meet the needs of complex shooting conditions. An antenna has been installed on the head allowing for short-range wireless communication as well as for detecting the surrounding environment parameters, such as the degree of atmospheric scattering at different times, the air-specific heat, and even wind speed and dust content. These parameters will be transferred to the MS-05L Zaku Sniper Type OS environment-specific calculation module, which will enable the pilot to take the most accurate shot possible. For powering its beam sniper rifle, it is outfitted with an external auxiliary reactor with a rated ouput of 700 kW. The right knee has a collapsible strut for increased targeting and firing stability. Other weaponry include head vulcans and standard Zaku I armaments.